Visit Henley Beach and Semaphore Beach for some beach relaxation. Get outdoors at Thaxted Park Golf Club and Seacliff Beach. Change things up with these side-trips from Adelaide: Seppeltsfield (in Seppeltsfield), Murray Street Vineyards (in Greenock) and Tanunda (Langmeil Winery & Chateau Dorrien). 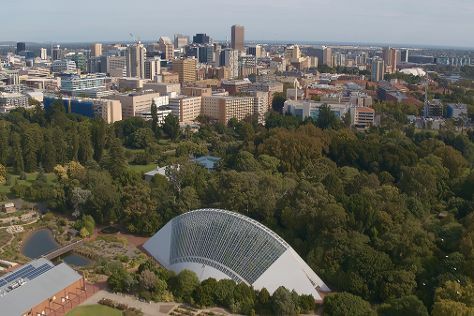 And it doesn't end there: wander the streets of Rundle Mall, look for gifts at Unique Opal Mine Pty Ltd, explore the world behind art at Art Gallery of South Australia, and don't miss a visit to Adelaide Oval. To find ratings, traveler tips, and tourist information, use the Adelaide trip site . Melbourne to Adelaide is an approximately 3.5-hour flight. You can also drive; or take a train. In February, plan for daily highs up to 32°C, and evening lows to 19°C. Finish up your sightseeing early on the 28th (Thu) so you can go by car to Victor Harbor. Victor Harbor is a town in South Australia on the south coast of the Fleurieu Peninsula, about 80 km south of the centre of Adelaide. Your itinerary includes some good beach time at Carrickalinga Beach and Aldinga Beach. Step out of the city life by going to Horseshoe Bay and Blowhole Beach. Explore Victor Harbor's surroundings by going to McLaren Vale (Wirra Wirra Vineyards, Fox Creek Wines, & more), Morgan Beach (in Cape Jervis) and Deep Creek Conservation Park (in Delamere). Next up on the itinerary: kick back and relax at Maslin Beach. Use Inspirock's suggestions to plan your Victor Harbor trip and find the best activities and attractions for your vacation. You can drive from Adelaide to Victor Harbor in 1.5 hours. Other options are to take a bus; or do a combination of train and bus. In February, daily temperatures in Victor Harbor can reach 32°C, while at night they dip to 19°C. Cap off your sightseeing on the 5th (Tue) early enough to travel to Kangaroo Island. Take a break from the city and head to Flinders Chase National Park and Browns Beach. You'll get in some beach time at Stokes Beach and Island Beach. 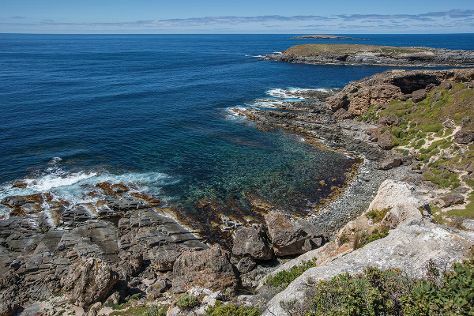 The adventure continues: look for all kinds of wild species at Seal Bay Conservation Park, get outside with Remarkable Rocks, take in nature's colorful creations at Kangaroo Island Spirits, and brush up on your knowledge of spirits at KI Spirits. To see maps, other places to visit, traveler tips, and more tourist information, you can read our Kangaroo Island trip maker app . Traveling by combination of car and ferry from Victor Harbor to Kangaroo Island takes 2.5 hours. Alternatively, you can do a combination of bus and ferry. Finish up your sightseeing early on the 11th (Mon) so you can travel to Port Lincoln. Get in touch with nature at Shark Diving and Sleaford Bay. You'll get in some beach time at Fishery Bay and Coffin Bay National Park. Step out of Port Lincoln with an excursion to Food Tours in Coffin Bay--about 32 minutes away. Spend the 14th (Thu) exploring nature at Lincoln National Park. There's lots more to do: identify plant and animal life at Mikkira Station, do a tasting at Dellacolline Winery, and don't miss a visit to The Old Mill. To find other places to visit, where to stay, and other tourist information, read our Port Lincoln route planner . You can fly from Kangaroo Island to Port Lincoln in 3 hours. Alternatively, you can do a combination of car and ferry; or do a combination of taxi, ferry, and bus. Finish your sightseeing early on the 16th (Sat) to allow enough time to travel to Mount Gambier. Get outdoors at Robe Beach and Naracoorte Caves National Park. Relax by the water at Beachport Surf Beach and Southend Beach. Explore Mount Gambier's surroundings by going to Coonawarra (Bowen Estate Coonawarra, Hollick Estates, & more). There's more to do: take in the dramatic natural features at Umpherston Sinkhole and explore the activities along The Blue Lake. For other places to visit, reviews, maps, and other tourist information, you can read our Mount Gambier road trip tool . You can fly from Port Lincoln to Mount Gambier in 3.5 hours. Alternatively, you can drive. March in Mount Gambier sees daily highs of 27°C and lows of 13°C at night. Wrap up your sightseeing on the 22nd (Fri) early enough to travel back home.